I made this fruit lollipop completely edible,so no chop sticks needed to hold this lollipop...I got many pats on the back for making this in a party...Making this lollipop is so easy,but i spent an hour to click the pictures..
4.Refrigrate the strawberry and dip in the chocolate until it coats well. Enjoy the chilled fruit lollipop...Bye. Lollipops looks delicious and inviting also..
super and yummy lollipop ..and nice way to make kids eat fruits .. Fantastic idea, always love the strawberries and chocolate combo..
Looks like a perfect party food! wonderful idea, looks pretty n yummy..do link to my event if u desire..
wow awesome dear.Perfect party treats. 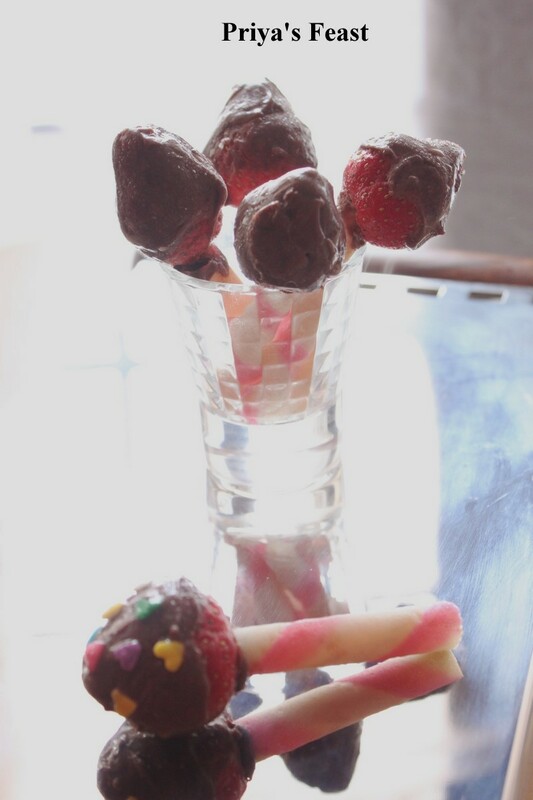 yummy n delicious lollypops...kids will love it!! anyone would love this... perfect for parties. Wow will love to eat these for sure.